As impressed as we all have been with the government’s plans for strength- and endurance-enhancing exoskeletons, the public reaction has been pretty consistent: what about paralyzed civilians? Although DARPA’s research will almost surely make it into the civilian sector at some point, a Massachusetts company called ReWalk has leap-frogged over the military-to-civilian transition to create the first and only FDA-approved robotic exoskeleton. The ReWalk is a marvel of engineering and almost a miracle for people who were once told they would never walk again. 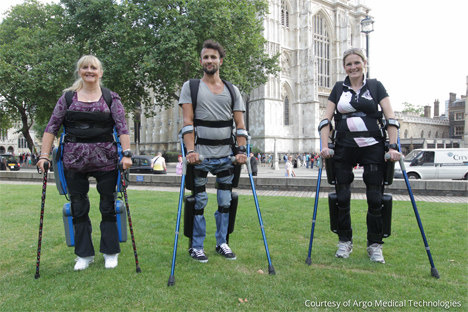 The exoskeleton allows users to walk indoors or out; to sit, stand, and climb stairs; and to get up from a wheelchair and exercise muscles that might not otherwise ever have the chance to be exercised. 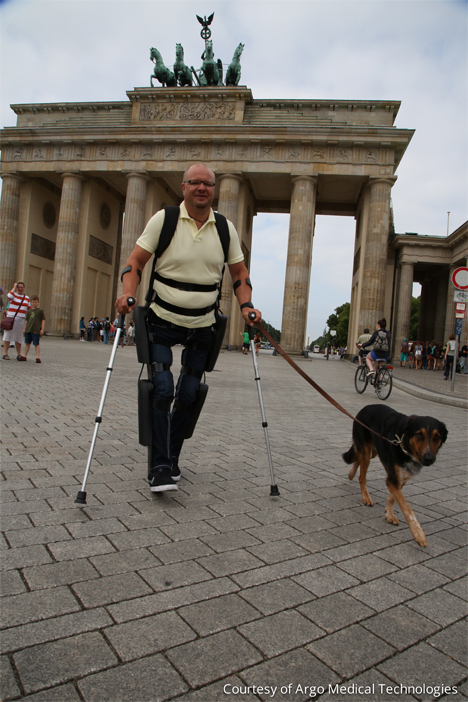 The first ReWalk prototype was developed in 2004 by Dr. Amit Goffer, himself a quadriplegic. He was motivated partially by the realization that modern wheelchairs really haven’t evolved much from the centuries-old designs seen on ancient Chinese vases. We have the technology, so why not put it to use changing people’s lives? During some of the first ReWalk demonstrations, observers were convinced that the users weren’t paralyzed at all. 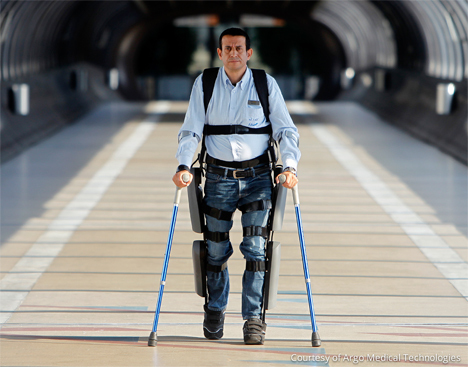 The exoskeleton allows for such smooth movement that, when it’s being operated by an experienced user, it is almost impossible to tell that the movements are being made by the machine and not by the person wearing it. 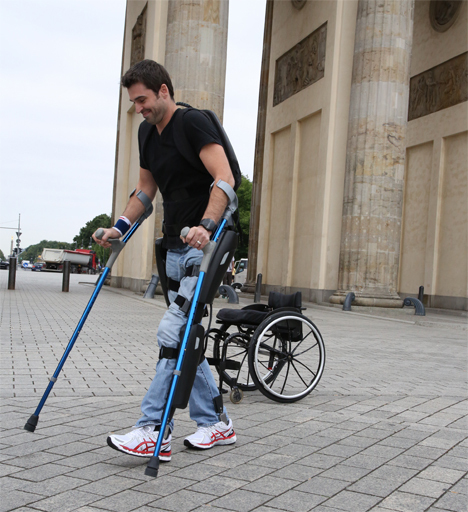 The ReWalk consists of two shoes, leg braces, crutches, a wristwatch controller, and a backpack in which the battery is stored. To operate the device, the user sets the watch to “walk” mode and leans forward. Each lean forward signals the machine to take another step. The user has to put in a fair amount of effort using the crutches to support his or her body weight and moving them to advance one step at a time. It’s tiring work, but by all accounts it is extremely rewarding. In clinical trials and rehab settings, most users have lost body fat and many have gained muscle. Although learning to use the device is hard work, seeing the look on a user’s face when they walk again for the first time is simply incredible. 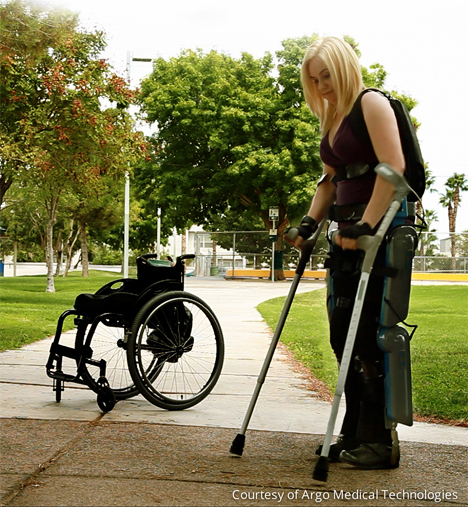 The ReWalk is currently available to purchase in the US and Europe for $69,500 (USD). Admittedly, this is far more expensive than even than even the most tricked-out electric wheelchair. But there really is no way to put a price on the freedom of being able to walk on one’s own. See more in Cybernetics or under Technology. July, 2014.